Two is better than one, especially when we’re talking about café-and-reading-room, Another Fine Day! 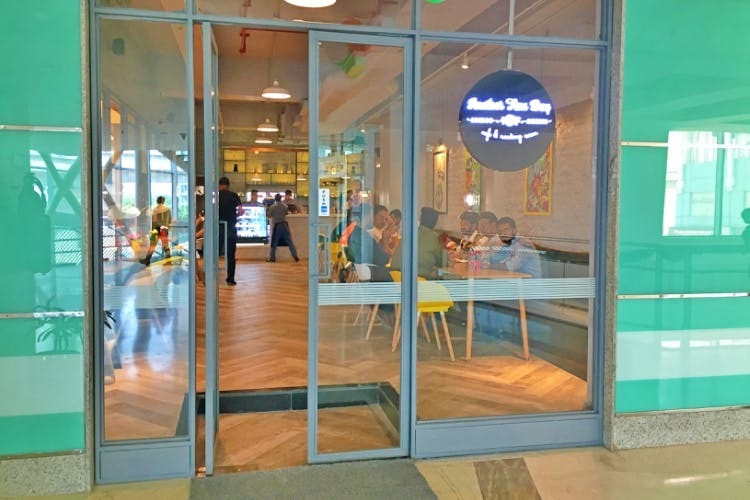 A new outlet of this Gurgaon-favourite has just opened in South Point Mall. The same brand of comfort food, only more of it, the menu at this new outlet is a lot larger. Loads of colour with a pristine backdrop of white, this is the ideal place for a leisurely meal or binge-reading. Apart from their signature breakfast which includes old-timers like Eggs Benedict, French Toast, Pancakes and Waffles, they also have the usual hot or cold Mezze, pastas and open sandwiches. Here’s what’s new though – there’s a Grilled Stuffed Chicken and Moroccan Chicken we loved, mainly because it’s perfectly cooked and served with yummy cous cous and cilantro tomato sauce. Vegetarians, we suggest you don’t miss the Cottage Cheese Steak. The icing on the cake, however, has got to be their pizzas; the Funghi is good for veggie-lovers but we could not get enough of the Seafood Pizza with shrimp, sole fish, calamari and olives. With WiFi, books and loads of space, you can bring your own book and laptop and work uninterrupted. There’s a long community table that faces a cheery, kids play area, so if you’re a parent, leave them at the adjoining playhouse and catch up on your reading over a leisurely cup of coffee. A reading room concept serves this café well – Another Fine Day is both well-lit and peaceful. If you want a larger dose of a happy place like Another Fine Day, plan your next date or schedule some ‘me’ time at their new outlet!